To say that buying a house is a learning experience is an understatement. Pair a home purchase with am immediate renovation and you’ve got education out the wazoo! As much as I like to learn things, and as often as not I tend to learn them the hard way, here are three things I wish I knew to ask of our contractor before we got started. Maybe it will help someone else getting their school of hard knocks degree in contractor negotiations. 1. Where will they pee? Yes, it sounds funny thatÂ this is the first question I wish I’d known to ask, but it’s indicative of all those little considerations that just don’t occur to you until after the fact. This particular one (of asking the contractor to include a Port-o-Let in their estimate) was suggested by an article on Houzz after our renovations had ended and I really wish I’d read it 6 months sooner. I remember thinking, after discovering the busted pipe a few days after closing (that Todd was able to fix, thankfully) that we needed to make sure it was safe to leave the water on while the workers were here so that they’d have access to the facilities and to water and whatnot. It was a kind thought, and I give myself credit for that, but I regretted it soon. The first week the work crewÂ was in they used up almost all the paper goods we’d bought right after closing. That amounted to a case of paper towels and a a large package of toilet paper, and left trash everywhere. And if that wasn’t enough, they also helped themselves to a pair of work gloves Todd had left out on our makeshift dining room table, ruining said gloves by using them to removeÂ the old roof, and sopping up who knows what with one of the bath towels I’d brought up, leaving it crumpled and soaking wet (and filthy) and thrown into the closet under the stairs. Had we put off our next trip up by a week, May’s heat and humidity would have rendered that a mess of mold and mildew right behind our downstairs a/c filter. It was a small but shattering sound heard as my goodwill towards the work crewÂ evaporated. Lesson learned: hide everything you don’t want them touching. Which we did in a giant storage tote tucked into one of the downstairs closets. 2. Who will actually be on-site? This doesn’t mean I expect to vet the work crew before agreeing to the bid–that’s a lot to ask even of the most corporateÂ outfits. No, I mean who’s actually going to be on-site and in charge during the day-to-day of the project. It never occurred to me (that’s a theme, here) that the contractor I made all these arrangements with might leave someone else in charge of the work being done on the biggest single purchase of my life. Especially not when this is, ostensibly, a one-man-and-his-crew operation and not some big corporate contractor. But that’s exactly what happened, at least in certain instances that I can be sure of. Overall, I’m left to wonder how often the man I trusted my home to was really there. The first inkling we had was when we discovered the house key sitting on the top ledge of our front door. Apparently no one person could be bothered to be in charge of our key, so they just left it “hidden” for whoever showed up first the next day. Another time we found the keyÂ inÂ the lock on the back door when we came home (after we’d already moved all our stuff in). To say I was not pleased was an understatement, but at least they were making sure the doors were actually closed and locked (more than once in the early days I came home to find doors yawning open). But the most damning evidence came at the end of the job, when they started to work on the exterior. 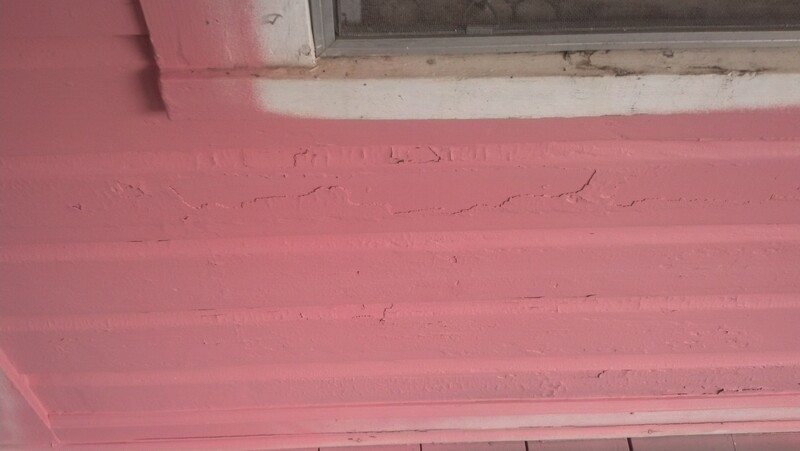 They’d removed the loose materials and the first coat of our chosen color (Del Coronado Peach, fromÂ Valspar’s National Trust for Historic Preservation color line) was going up! Only problem was, it looked like crap. 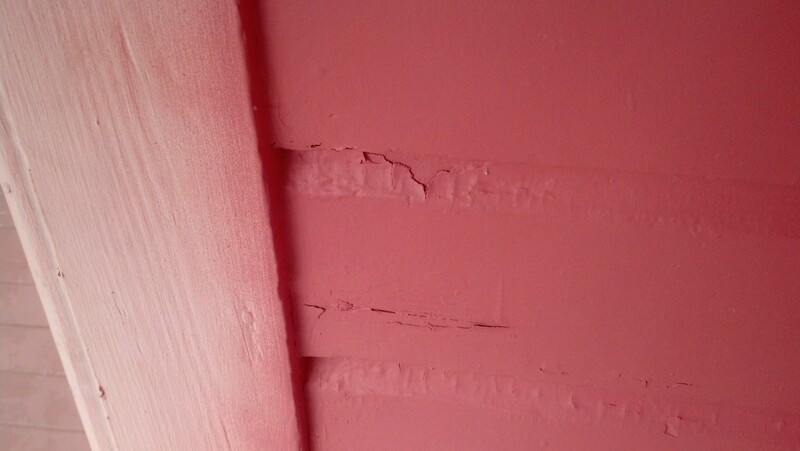 Not the color (though haters of our peachy-pink might disagree), the surface. They put the first coat of paint on (no primer, by the way) and that same afternoon Todd went by and the paint was already bubbling, peeling, and showing every single rough edge where the still-adhered previous paint was firmly stuck. When I voiced my concern our contractor explained that it was just the first coat and that once 3-4 were on, none of that would be a problem. Ignore the purple-look in this picture, trick of the light or something. But it’s a great example of the insta-peel paint feature we didn’t ask for! So then I sent these pictures of what we were seeing on the front of the house, to be very specific of what we saw as the problem. That’s when he replied, “oh, I wasn’t actually there, yes, we’ll make it right” and they spent the next week prepping the entire exterior, feathering out the edges of the well-adhered paint and sanding the bare clapboards, like they needed to do in the first place. And when the weather cleared (barely) enough for them to start painting again? A coat of primer was also used. Now, some of this might have been unfortunate timing: we’d had to push back the closing so many times and then wait on the last-minute update to the contractor’s license before permits could be pulled and work could begin. I fully acknowledge that the more than 2-month delay made it necessary for our contractor to split his time between our job and whatever came up in the mean time, but I still think it’s a question I should have asked. 3. Can I get that in writing? And by “that” I mean the warranty–not just the contractor’s guarantee of their labor but, and perhaps more importantly, the materials warranty on something like your roofing shingles. According to my contractor, he (verbally) guarantees his labor for 2 years. Okay, so for the first two years if something goes wrong I can call him and he’ll deal with it. Sounds good (and this conversation was had when I’d already had to do just that, the week after we moved in). 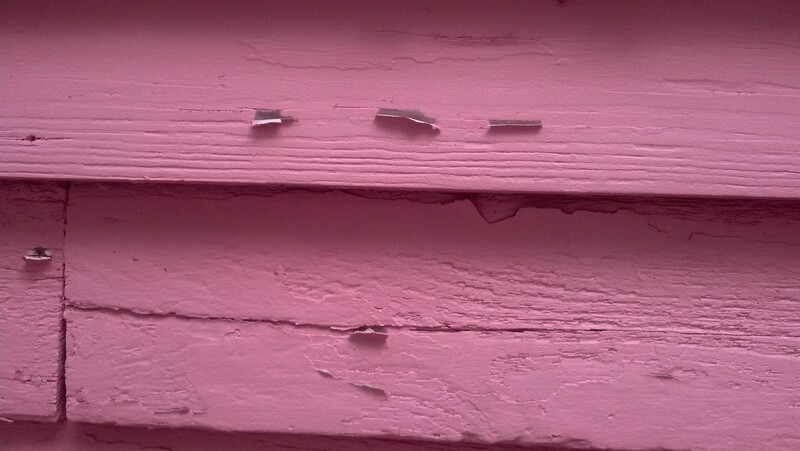 The shingles he put on our roof, though, they come with a 20 year manufacturing defect warranty. Now, a lot can happen in 20 years. Our contractor may have picked up stakes and moved away (or worse) by the time something comes to light with the shingles. Could there be a recall down the line? How would I know? These days when you buy electronics or appliances, there’s a little warranty card and lots of legalese in the packaging. That plus your receipt can help you out of jam should something go wrong sooner than normal usage would allow. But a roof? I didn’t purchase the materials outright so that’s not much help, and aside from the conversation we had while he was back up on my roof, I’ve got nothing to go on. As much as it pained me to contact him (dislike of confrontation and/or rocking the boat, I admit it), I did put on my big-girl pants and email him a request for something in writing. We’ll see what becomes of that. Egh, hand workers used up all our toilet paper just in the day or two that they were in our bathroom making repairs in a wall since they’d missed a leak during construction. I was so annoyed because there was still a public bathroom meant for the business below us that was open for use, and using all our TP just meant they were doing number 2 all the time. It was only like two guys too. How is that possible?! So many good tips. I would be furious about the house key. Shortly after our building was finished, one of the tenants in a penthouse was woken up in the morning by a worker entering their house with a key. They had already done the whole handover and moved in and this worker was just waltzing in. Not even to do work… he was totally surprised someone was in there. Maybe he was just looking for a private place to take a dump? They do seem to do that a lot. But the owner was livid and demanded that they change his locks because it was a breach of his privacy to have leftover keys out there after they had handed over everything to him. Interested to hear what else you have to say! There sure is a lot of struggle with renovation and home ownership! Oh my, that’d be so freaky to have someone just waltz into your home like that! I’d have raised all kinds of hell had that happened to me. Oh my goodness…I can’t believe they used your bath towels!!! That’s crazy!!! I would be more than furious. Luckily, our contractor and his guys have been awesome but we have the added advantage of my retired father being right across the street from our house and watching their every move. Todd would cruise by on his lunch break of after work since he was nearby, but we pretty much had to go on faith for the most part. I don’t think I’d ever want to do that again!